Are you looking for the PERFECT tenant for your Vancouver 2010 Rental? These are tough times for local real estate developers and Greater Vancouver builders are feeling the pinch of financing issues and the downturn in the global economy. In addition, with many pre-sale homebuyer not in the market anymore and with property investors staying away from pre-builds, there have been a number of cancelled Vancouver condo projects and condominium development cancellations in the Lower Mainland recently. There are several Vancouver condo cancellations that have not fared well, and some Greater Vancouver condo developments have been cancelled outright this year. These recent condo cancellations of Vancouver condominium and townhome projects and cancelled Vancouver real estate properties have increased fear in the Lower Mainland property market and homebuyers are staying away from pre-sale and pre-construction condos not completing within a month or two. Here is the most comprehensive list of cancelled Vancouver condominium developments including those Lower Mainland condo projects that are officially cancelled. Here is an official list of cancelled Vancouver condo projects and the reasons for their cancellations. Get cost-effective help from a reputable Vancouver law firm and minimize damage to your financial future. Lower Mainland condominium developments that were passed by city council, designed, planned, marketed but the property developer has pulled out for various reasons such as project financing problems, low return on investment , high trades costs or low pre-construction Vancouver condo sales. Therefore, these Greater Vancouver cancelled condo projects have subsequently been pulled off the market and is a no-go. Cancellation of Vancouver real estate developments has a negative impact on homebuyer who had secured deposits in these purchases during pre-sales. The homebuyers will get their deposits back from any cancelled Vancouver condo project, but they would have missed out on any gains if they were to put that deposit money into any other investment vehicle. In addition, a cancellation of a Vancouver real estate development property would give the developer a harder time to seek proper financing for future developments and from the prospective homebuyers eyes, a developer/builder in Vancouver that cancels a condominium project is seen as untrustworthy or not experienced. Some of the cancelled Vancouver condo projects were to be landmark iconic architectural buildings, so the city has lost some of its glamour when it comes to proving that it is a world-class metropolis. Other Vancouver condominium developments that have been recently canceled should not have been passed by City Council to begin with, so there are no losses there. The cancellation of Vancouver real estate developments creates the biggest buzz in headline news and much speculation often begins about homebuyers not getting their money back or losing out, or the Developer has gone bankrupt or other speculative news stories that result when a condo project is cancelled in the middle of construction especially. Other projects that are cancelled during pre-sales don’t have such a big impact as the public doesn’t see any construction progress yet (unless there is a huge hole left in the ground!) OVERALL IMPACT: A reduction in the number of units coming onto the Vancouver real estate market means that the overall balancing act between buyers and sellers will come about quicker than originally anticipated. With supply and demand leveling out due to the cancellations of many large Vancouver condo projects and other townhome developments being cancelled at the moment, there will be a lesser influx of new units onto the Vancouver housing market than predicted for 2010 and beyond. 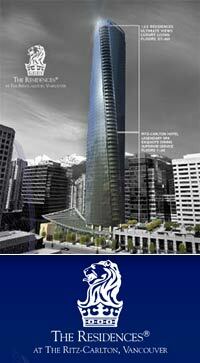 Update: July 2009 - The Holborn Group has confirmed that the 600 foot Vancouver Ritz Carlton condo hotel is a go. The exterior facade will stay Arthur Erickson inspired, but the interior floorplates will change with smaller market condominiums for sale, and a decrease in the number of hotel suites. June 2009 - The Holborn Group has announced that there are initial plans to go forward with the construction of the pre-sale downtown Vancouver Ritz-Carlton residences that were initially cancelled. Name ‘Vancouver’s Turn’, the Luxury Residences at Ritz-Carlton Vancouver condo tower residences would have been the second tallest building in the downtown core if it wasn’t for the project cancellation this year. Citing problems with pre-sales (less than 50% of the pre-construction condos at the Ritz Carlton Vancouver condo residences were sold to prospective homebuyers) and with the worsening global economy, the Holborn Group pulled the plug and cancelled what could have been the most striking condo tower in the Coal Harbour, Downtown Vancouver real estate market. Featuring an exterior design by world famous Arthur Erickson, the pre-construction Residences at Ritz-Carlton Vancouver was cancelled in early February 2009. The cancellation of the Vancouver Ritz-Carlton luxury residences did not come as a surprise, however. Late fall of 2009 saw the Ritz-Carlton Vancouver condo residence project construction on hold as marketing and advertisements were taken down from the site and the sales office was closed. Citing problems with a re-zoning permit for the parkade, the public knew that the Vancouver Ritz-Carlton Residences were in trouble, and the cancellation of the Vancouver Ritz Carlton therefore didn’t come as a big surprise to many homebuyers, industry experts and pre-sale condo purchasers. All deposits will be returned to the pre-sale homebuyers at the cancelled Ritz-Carlton Vancouver condominiums. FINAL THOUGHTS: The cancellation of the downtown Vancouver Ritz Carlton condo residences is a big loss to the city as it would have been the landmark Vancouver condo building with its unique architectural design. 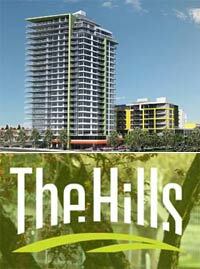 The latest update is the The Hills has been renamed and relaunched as 2300 Kingsway Vancouver condos in the East Vancouver real estate market. The Holborn Group got into even more trouble with the cancellation of yet another condo project in the heart of the East Vancouver real estate market. 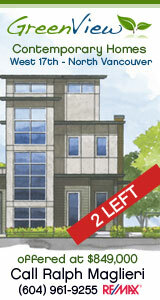 Dubbed The Hills Vancouver Condos and City Homes and marketed by Rennie Marketing Systems, there was no chance that the pre-sale Hills condominiums in East Vancouver cancelled condos would have sold many at pre-construction. On the contrary, pre-construction condo sales at the Vancouver Hills Holborn Group development stalled and the developer was left with fewer than a handful of presales and hence the cancellation of this Vancouver condo project. With financing problems and a slowing homebuyers market and with speculative investors out of the market, the Holborn Group decided to cancel the Hills East Vancouver condo project in February 2009. Featuring over 280 suites for sale, the location of the East Vancouver Hills cancelled condos was not ideal for many couples and families as it is still an up and coming area. At Nanaimo and Kingsway, home buyers were also not very impressed with the cancelled Hills Vancouver condo interiors and standard features when compared against other developments around the price range. However, it was ultimately not the prices of these pre-sale Hills Vancouver condos that caused the cancellation in this Vancouver real estate project. It had more to do with the Holborn Group not getting the financing it needed to complete the project due to the lack in pre-sales prior to construction. FINAL THOUGHTS: The cancellation of the East Vancouver Hills condos cancelled did not come as a big surprise as it was another forgettable mid-rise somewhat affordable condo building with large windows and many floorplans to choose from. Featuring a prime Southeast False Creek real estate location, the unsuccessful pre-sales grand opening and subsequent pre-construction sales figures have forced Wall Financial to cancel the Wall Centre False Creek condominium project in Vancouver real estate market. Citing very poor sales (approximately 30 of the over 400 condo suites at Wall Centre False Creek cancelled condo project actually sold during pre-sales events) and with increased competition from the build out of Millennium Development’s Millennium Water at the 2010 Olympic Village, the Wall Centre False Creek condo development was subsequently cancelled and became another significant Vancouver condo project to get cancelled amidst poor sales and a gloomy property market forecast. Featuring luxury condos that started from $429,900 and with high end features such as Sub-Zero, Walk and Faber, the public homebuyers were just not ready to shell out the money for smaller waterfront suites in a developing community of Southeast False Creek real estate. As the fiasco surrounding Millennium Water turned up, the Wall Centre False Creek cancellation followed right afterwards as Wall Financial pulled the plug right away and Rennie Marketing Systems ceased to advertise the condo Vancouver development shortly there after. FINAL THOUGHTS: LEED Silver Certified and BuiltGREEN, the cancelled Wall Centre False Creek condo project would have been a welcome addition to the Vancouver waterfront skyline. 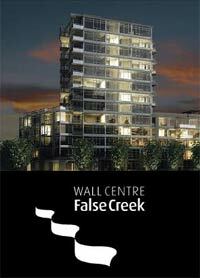 However, because of the slowdown in the pre-sale Vancouver condo market plus the steep prices for smaller floorplans in an up and coming neighbourhood plus the inadvertent link to Millennium Water next door, the cancelled Wall Centre False Creek condominium project became and afterthought in the Vancouver property scene. Most people haven’t even heard of the project and this Vancouver condo cancellation was not in the headline news either. Wall Financial may reconsider a new project on that site when the market rebounds. The Eden Group of Companies has been mentioned many times in this Vancouver cancelled condo project webpage and so they deserve it. Hot on the heals of the Oakridge Montgomery Estates townhome cancellation, the Eden Group of Companies also announced the cancelled Elyse Vancouver condominium project. Their announcement came at a time during the slowdown in the Vancouver real estate market and its location at Scotia Street and East 7th Avenue did not help matters. Homebuyers and pre-sales purchasers were hard to come by and the pre-construction condo sales at the Elyse Vancouver condos were very poor. In addition, the floorplans at the East Vancouver cancelled condos at Elyse were not very functional and there was a lot of wasted space in many of the layouts. The interior finishes and features were fine, but with a reputation for cancelled condo projects, the Eden Group of Companies Elyse condominiums did not even launch before it was canceled due to many reasons. Starting at an affordable price point of $200,000, first time homebuyers simply didn’t like the offering presented at the cancelled Vancouver Elyse condos and that was it. 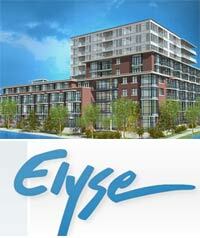 FINAL THOUGHTS: Again, another forgettable cancelled Vancouver real estate condo development at Elyse Living was brought to the market at the wrong time by a questionable developer. This Vancouver developer had a few problems in 2007 including financial problems and a slowdown in the real estate market pre-sales. 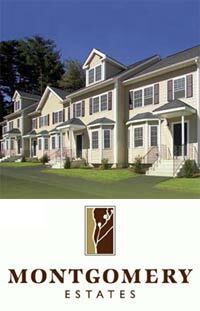 The luxury townhomes at the Montgomery Estates in Oakridge neighbourhood was suppose to be a boutique style family oriented community that was cancelled in October 2007 shortly after the announcement of the other cancellations of the Eden Group of Companies developments. Starting from the low $400k range, the cancelled townhouses at the Eden Group Montgomery Estates were affordable for growing families, but with the economic and financial strain on the developer, there was no way this development could take flight. Construction never started on the cancelled Oakridge townhomes at Montgomery Estates and the pre-sales never lifted off either, selling fewer than 10 of the 31 available pre-sale suites at the time. FINAL THOUGHTS: Forgettable architecture, location, floorplans and features, the cancelled Montgomery Estates Oakridge townhomes was another bad offering by the Eden Group of Companies. Due to delays in respect to the development approval process for the Okanagan Greata Ranch Vineyard Estates, including the amendment to the Area F Liquid Waste Management Plan of the Regional District Okangan – Similkameen, Concord Pacific has officially cancelled the Greata Ranch Vineyard Estates real estate development. Due to the fact the schedule was severely impacted due to the wait time for the development approval in addition to the economic worries and fewer hombuyers looking at purchasing at the Greata Ranch Vineyard Estates Okanagan property, the plans are to completely cancel the project and focus on other city developments at this time. 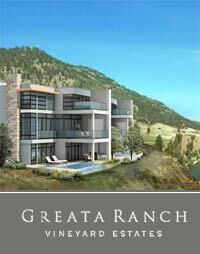 Although a very unique and exciting Okanagan resort style development, Concord Pacific really did not receive enough pre-sale interest in the Greata Ranch Vineyard Estates. Located on the sun drenched shores of Lake Okanagan, it is Concord Pacific’s hope to one day launch the Greata Ranch Vineyard Estates Okanagan property, but as of this point, sales and marketing have ceased and construction is halted permanently.